It's that time of the year when you want your house to be as fresh as the outside air. It all sounds nice until you walk into a room and get totally overwhelmed by all of your kid's toys. After much trial and error and lots of missing pieces, let me offer some creative ways that I've found to store common playroom items to save a little space and make cleanup a little easier. Puzzles: In my experience, the best way to store board puzzles is to use these large plastic envelopes from the Dollar Store. There are three in a pack for only ONE dollar. Another option is to use a pencil case for easy storage of small puzzles. Be sure to keep a copy of the picture in the pouch as well! Matchbox Cars: If you have cars everywhere and don't want to spend money on bringing in more plastic containers, the perfect DIY solution is to save cardboard rolls from toilet paper and paper towels and arrange them to fit nicely in an old shoe box. You can even get fancy and decorate the outside of the box to give it even more character. Another option for storing cars off of the ground is to use the over the door organizer (see Barbie idea below). Barbies: Drop the Barbies into a see-through, over-the-door shoe organizer to keep a visualization on the inventory without having to dump everything out looking for that ONE particular doll or accessory. LEGOS: I got extremely lucky and found these lego block storage drawers on clearance at Staples, of all places, for $20! They have multiple colors and they stack on top of each other, in true Lego fashion. If you cannot find these or want a more frugal option, the Dollar Store has a great variety of plastic containers. Create a custom label and throw some packing tape or contact paper over the top of it to make the label more secure. Art Supplies: No matter what art supplies are in your rotation, cookie jars, apothecary jars, mason jars, etc. are all great options for storage. 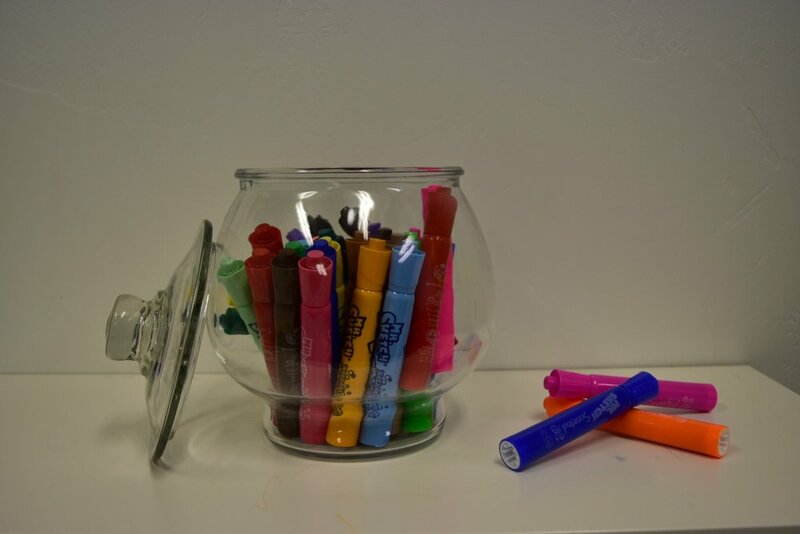 The bright colors of these supplies usually make the space more vibrant and fun to be around. Keep in mind the age of the children who will be using the containers and stick to a more durable glass, the younger they are. Nerf Arsenal: I have yet to see a more creative and impressive storage for Nerf paraphernalia than this one I spotted on Pinterest. Balls (rubber, sports): Throw balls in a cute wire basket that can be easily moved outside to be played with and makes cleanup a breeze. Laundry baskets are often the perfect size. Stuffed Animals: Use the outside cover of a beanbag chair with a zipper to throw stuffed animals into and fill it up with plush friends that you aren't quite ready to get rid of, but don't get played with too often. Get cushy as you use the chair to sit and read books and just unzip when you need an old friend to cuddle. Workbooks/Activity Books: A unique dish drying rack or magazine holder is a great way to store and easily see the collection of coloring books and even colored paper. It definitely beats endless stacks collecting dust in cold, dark places. Works of Art: There is an endless list of ways to display works of art, but two of my favorites are to hang string with colorful thumb tacks and hold up creations with clothespins (which can also be customized with stickers and/or washi tape) OR use a big shadowbox frame to hang on the wall and fill with special designs. Both of these options make changing out masterpieces a cinch.